His dad used his famous Instagram account to get her back home again. Micha Porat was driving home one night when he spotted something darting across the road. Thinking maybe it was a stray cat or a rat, he stopped his car and got out to check - and discovered a little Chihuahua, terrified and wandering the streets all alone. "As I walked closer, the Chihuahua ran away scared," Porat told The Dodo. "There were cars coming back and forth as she was in middle of street. I stopped cars in middle of road that could have hit her and told them to stop and watch for the Chihuahua." Porat called over some passersby out walking their dog and told them the situation, and with their help, Porat was able to catch the little dog. He decided to take her home with him, in hopes that maybe he could try and find her owner. As soon as the pair arrived home, they were greeted by Porat's own dog, Gomi. 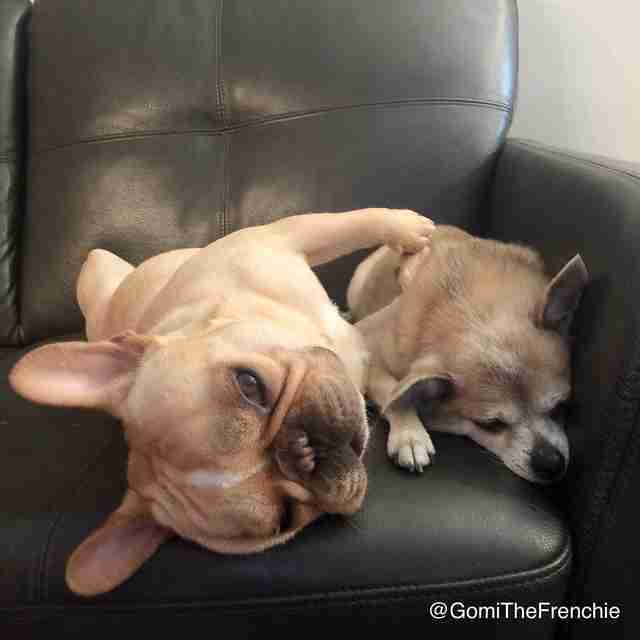 Gomi is a goofy, energetic 2-year-old French bulldog, who immediately welcomed the lost dog into his home. 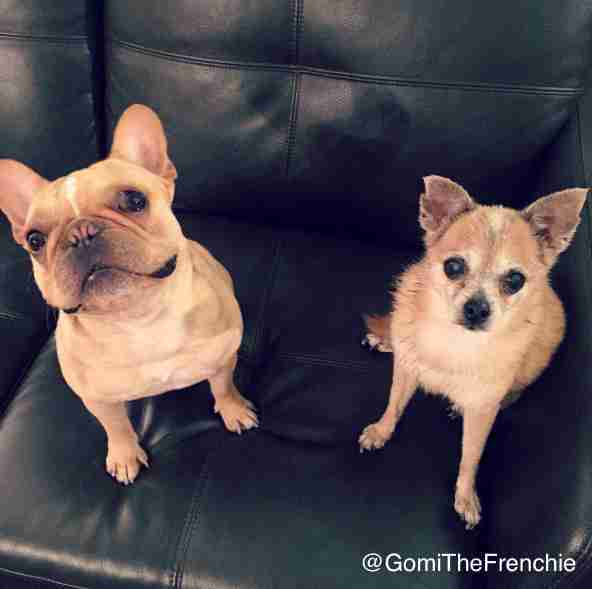 The Chihuahua was clearly much older than little Gomi, but the pair still got along great, and loved to snuggle and play together from the moment they met. "Gomi was always trying to play with her but I kept telling him to relax because she could have been through a lot," Porat said. "They snuggled together at night and both slept with me in bed." Even though Gomi and his new friend got along great, Porat still hoped to find out where she'd come from - and that's when he had an idea. Little Gomi is actually an Instagram-famous dog, with more than 80,000 people following his account. His dad decided to post about the lost Chihuahua on Gomi's Instagram, hoping that at least one of his thousands of followers might be able to help. "I posted photos and videos of them on Gomi's Instagram announcing that we found a lost Chihuahua and if anyone had info to please contact us; we are trying to find her owner," Porat said. "I was worried though that I wouldn't find the owner, so I started reaching out to rescues to try and find her a good home." Then, something amazing happened - Porat got a few different messages from people who recognized the dog. 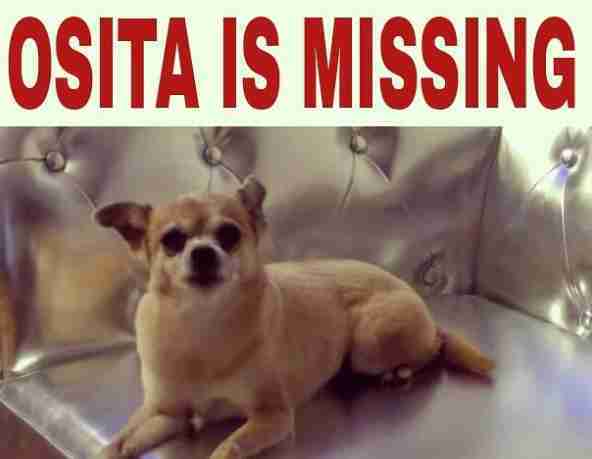 Her name was Osita, and her dad was desperately trying to find her. As it turns out, 14-year-old Osita went missing after she accidentally got out of her dad's garage, around 10 blocks away from where she was found. Osita is a therapy dog who works at her dad's business, Gustavo Briand Hair Studio, where her dad had recently been doing a bunch of renovations. He thinks that Osita was stressed from all the change, and that's why she bolted. "When she got out of the car she ran out of the garage door as fast as she could," Gustavo Briand, Osita's dad, told The Dodo. "I thought she had to pee or something, but when I tried to follow her she was gone. We searched for her until 3 a.m. and couldn't find her." Briand was devastated when Osita ran away, and had little hope that she would find her way back home again due to her age. Just in case, though, he made missing dog flyers and posted them all over social media, hoping that maybe someone would recognize Osita on the streets somewhere. "I was sure that she was not going to be taken in by anyone because she's so old," Briand said. "Then one of my Facebook friends posted Micha's post on Facebook, and I saw it and said, 'That's my dog!'" Once Briand and Porat got in contact, they arranged a time for Porat to bring Osita home. Briand was overjoyed to see his dog again, and Osita was happy to see him too ... but of course, she was sad to leave her new pal Gomi, and misses him already. If Porat hadn't thought to use Gomi's account to help Osita, she and her dad may never have found each other again. 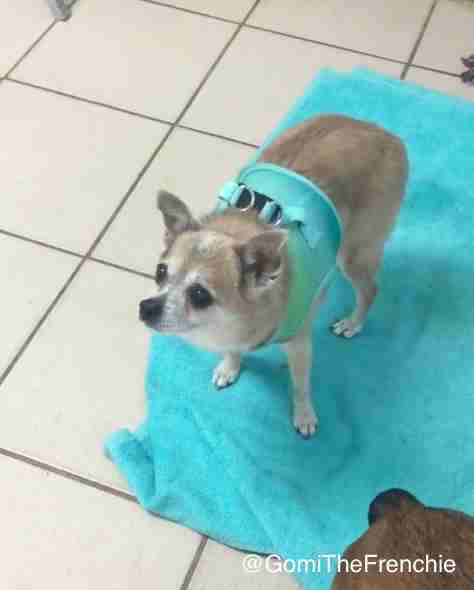 Now they are happily reunited, and little Osita can continue to live out her golden years in peace. "She was missing just a day and a half, but enough to drive me crazy," Briand said. "She's my baby." 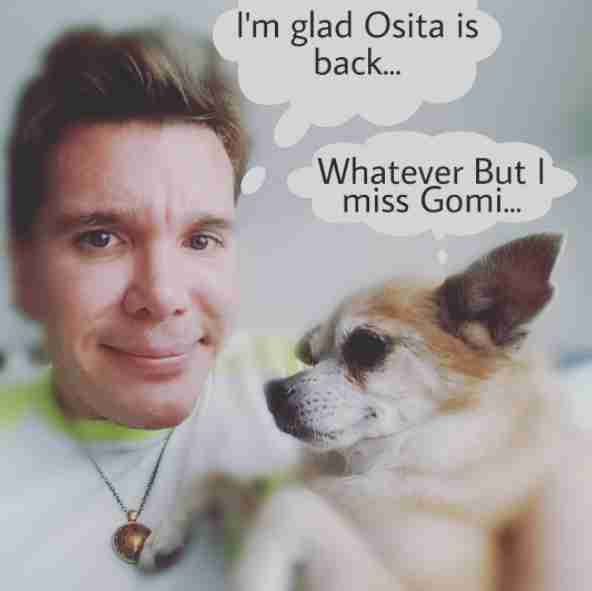 You can follow Gomi's adventures on his Instagram account, and Osita's adventures on her dad's Instagram account!